At The Altman Law Firm – Successfully Handling Miami Injury Cases is our only goal. Jeffrey S. Altman has been representing injury victims since 1998. We have never represented an insurance company. We only represent the Injured Victim or families of Wrongful Death Victims. This is something we take great pride in – fighting for victims that often cannot fight for themselves. Quite often these tragedies arise from Car Accidents, Bicycle Accidents, Negligent Security, Commercial Vehicle / 18 Wheeler Accidents, Motorcycle Accidents or Pedestrian Accidents. Our law firm has been blessed to be successful over the years. This is not patting ourselves on the back. It is a reason that makes us better equipped to handle larger catastrophic injury cases, traumatic brain injury cases and wrongful death cases. These cases can be very expensive to litigate properly. In almost all of these types of cases the lawyer advances funds for all costs involved. If the lawyer is not previously successful, and does not have the necessary funds, common sense dictates that the lawyer will not be able afford to properly investigate the case and hire necessary experts and investigators to get the best result possible for the client. 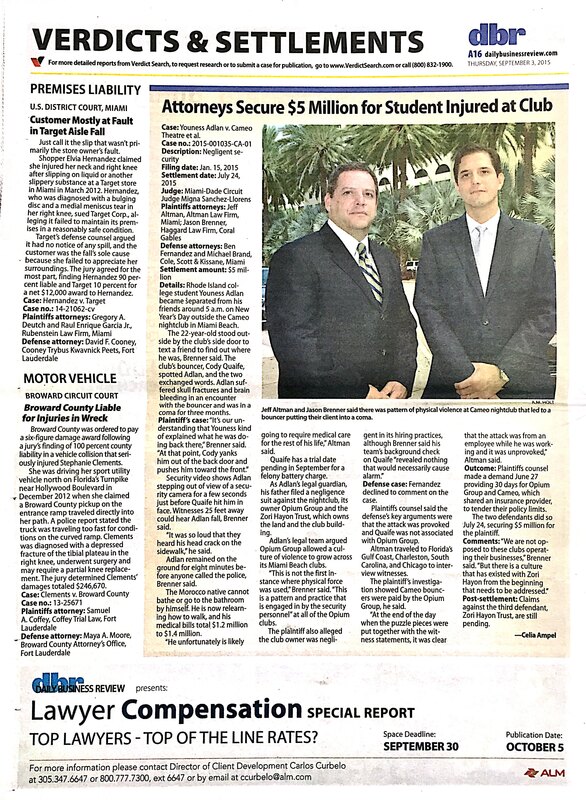 This is why several lawyers in South Florida refer cases to The Altman Law Firm to litigate. We front a significant amount of money to get to the bottom of facts and hire the necessary experts to prepare for a Jury Trial. As an example, in 2014, a case was referred to The Altman Law Firm. The original lawyer advised that there was no offer to settle the case after he made a reasonable demand. The case resulted in a $807,600.00 Jury Verdict in Miami-Dade County – one of the highest workplace negligence verdict in Florida in 2014. 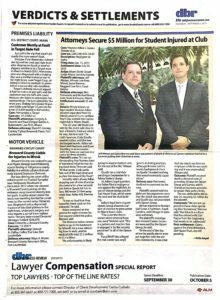 Mr. Altman was recently profiled in and appeared in several news publications and broadcasts as a result of the successful handling of a Negligent Security case. We hope you never need the legal services of The Altman Law Firm for a Traumatic Brain Injury or Wrongful Death. But if the situation arises, our office is located at 10800 Biscayne Boulevard, Suite 700, Miami, FL 33161. Call us for a free Consultation at 305-373-3730 or 888-991-2889. We are minutes away from North Miami, Miami Shores, North Miami Beach, Aventura, South Beach and Sunny Isles. However, we handle cases throughout Florida. Mr. Altman also visits clients at their location (home or hospital) as often their injuries prohibit travel to his office.